You are here:Home » Promotion / Events » BATA Club, First-Of-Its-Kind Singapore Loyalty Programme! BATA Club members can enjoy a flat 5% off on all items (discounted items included, limited to items below 50% discount). Members can enjoy various vouchers with no minimum spending required when reaching different tier status in the membership. No registration fee or renewal fees required. Complimentary SGD 10.00 voucher upon sign-up with full profile details completed. Birthday bonus - 20% discount voucher will be sent to the member's registered mobile number, redeemable with no minimum purchase required. Valid only for one month. Redemption offers on selected categories / brands. Access to exclusive events and new product launches. Dedicated discounts and delightful surprises. Based on one's annual spend, BATA Club members are automatically enrolled into one of the three membership tier levels: Silver, Gold or Platinum. 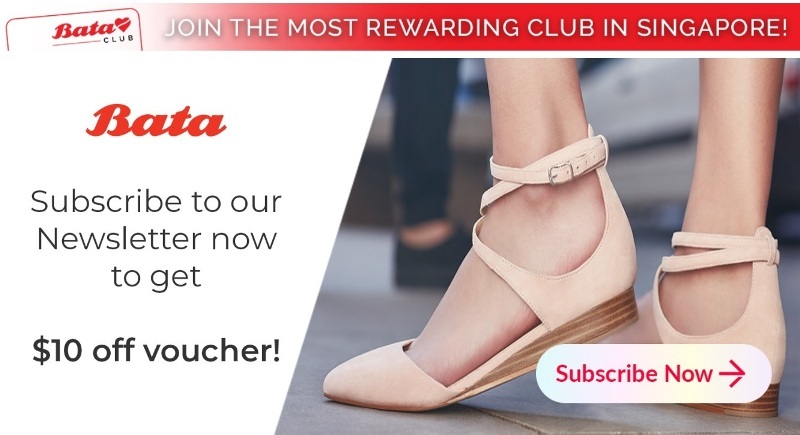 BATA Club members will be automatically upgraded when their annual spend at Bata increases. Silver ($30 - $199) - $10 Voucher Valid for 3 months with no minimum spending. Gold ($200 - $499) - $10 Voucher Valid for 3 months. Additional $10 voucher after reaching $350 Spend valid for 3 months with no minimum spending. Platinum ($500 and above) 3 X $10 Voucher Valid for 3 months. Additional $10 voucher after reaching $750 spend valid for 3 months with no minimum spending. To facilitate the registration of the BATA Club membership, Bata has introduced the 'Missed Call Campaign" initiative offering customers the simplest call to action by giving a missed call to a unique number (+65 3159 3074) at anytime, anywhere. Customers will receive instant offers, updates and a registration link for the BATA Club membership via an SMS. Customers can also register for the BATA Club membership via Bata's website or at any of the Bata stores islandwide. BATA Club is open to all individuals, residents and non-residents of Singapore aged 18 years and above at the time of application. The programme is limited to Bata stores in Singapore only. In celebration of the new BATA Club membership, Bata will be hosting an exclusive shopping event specially for members in October, followed by exciting shopping events, collection previews and sales every month. My hubby is a member. We just bought some footwear from Bata this month not so long ago. What a nice deal! Cute shoes, too! seems like a great membership card. It's weird, thank you for the deal! I hope you will participate in my international competition! Omigosh .. most of my shoes are from Bata. I wonder if they have a similar club here. I will definitely join ..haha!!! Those shoe are super cute. Thanks for sharing this program with us. Oh! I must check out the membership. I need new shoes. LOL! Gee, Bata has been around for years hasn't it. Good to know, dear! Bata is a pretty good shoe brand! I remember this brand when I was growing up in the Philippines. Nice to know they are still around and is getting stronger. Cute shoes! Never heard of Bata. I'll have to see if it's available in the US.